Tame Impala ( /teɪm ɪmˈpɑːlə/) is an Australian psychedelic music project led by multi-instrumentalist Kevin Parker, who writes, records, performs, and produces the music. As a touring act, Parker (guitar, vocals) plays alongside Dominic Simper (guitar, synthesiser) and some members of Australian psychedelic rock band Pond – Jay Watson (synthesiser, vocals, guitar), Cam Avery (bass guitar, vocals), and Julien Barbagallo (drums, vocals). Previously signed to Modular Recordings, Tame Impala is now signed to Interscope Records in the US, and Fiction Records in the UK. Parker originally conceived the project in Perth in 2007. After a series of singles and EPs, in 2010, the band released their debut studio album, Innerspeaker, which was certified gold in Australia and well received by critics. Their 2012 follow-up, Lonerism, was also acclaimed, reaching platinum status in Australia and receiving a Grammy Award nomination for Best Alternative Music Album. The band's third album, Currents, was released in July 2015, and like its predecessor, it won ARIA Awards for Best Rock Album and Album of the Year. Parker won the APRA Award for Song of the Year 2016 for Currents' first track, "Let It Happen". The origins of the act can be found in the Perth music scene. Parker played in a number of bands, one being the Dee Dee Dums, a rock duo that consisted of Parker (guitar) and Luke Epstein (drums). Tame Impala emerged in 2007 as a Kevin Parker home-recording project in this period and he posted a number of tracks on Myspace. This brought interest from a number of labels and eventually, he signed a worldwide deal with the independent Modular Recordings in July 2008. To transfer these recordings to a live-stage, Parker enlisted the help of Dominic Simper (bass) and Jay Watson (drums) and began playing at some local gigs. The signing was soon followed by the release of their self-titled debut EP in September 2008. Due to Parker's original artwork there was some confusion with the EP title and many believed it to be called "Antares Mira Sun". The artwork is an interpretation of a slide he saw in an astronomy lecture, which demonstrated the difference in size between the stars Antares, Mira and the Sun. The cover art is meant to be a painting; an interpretation of a diagram, so those labels are just there to make the diagram make sense. But lo and behold, there were reviews coming out saying "And Tame Impala's new EP 'Antares, Mira, Sun". 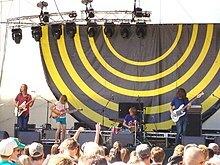 The Tame Impala EP reached the number 1 position on the Australian Independent Record Labels (AIR) Chart and number 10 on the ARIA Physical Singles Chart, with three songs, "Desire Be, Desire Go", "Half Full Glass of Wine" and "Skeleton Tiger" receiving national radio airplay on the Triple J radio station. Tours in 2008 included supports for You Am I, The Black Keys, Yeasayer and MGMT, as well as performances at Southbound Festival, Meredith Music Festival and Falls Festival, and national headline tours in support of their EP. Tours in 2009 included a sold-out six-date "Skeleton Tiger" national headline tour and a five-date UK tour (including Nevereverland UK), as well as performances at V Festival and Groovin The Moo, and a stadium tour with The Living End and Gyroscope. Tame Impala appeared on Triple J's Hottest 100 list in 2008—their first appearance on the list— with "Half Full Glass of Wine" at number 75. The song is also on the Hottest 100 compilation album. 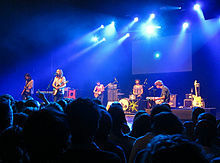 Tame Impala's first single, "Sundown Syndrome", was recorded at Toerag Studios in London, UK, with recording engineer Liam Watson, while the band was in the UK in March 2009. "Sundown Syndrome" was premiered by Richard Kingsmill on his "2009" show on Triple J on Sunday 10 May 2009. The song was released in July 2009 on vinyl, and digitally with a cover of "Remember Me" by DJ Blue Boy. The band then headlined the inaugural "Rottofest" in August 2009, an annual comedy, film and music festival held on Rottnest Island off the coast of Western Australia. Following Rottofest, they embarked on a national tour through September and October 2009 in support of the single. "Remember Me" appeared at number 78 on Triple J's Hottest 100 for 2009. "Sundown Syndrome" was included on the soundtrack of the Oscar-nominated film The Kids Are All Right. "Half Full Glass of Wine" was used in HBO's popular television series Entourage as the closing song for an episode. Tame Impala appeared at the Australian/New Zealand Big Day Out festival in early 2010, performing alongside bands such as Muse, The Mars Volta, Kasabian and Rise Against. Tame Impala's debut album Innerspeaker was released on 21 May 2010. In the UK the official release date was 28 June, but iTunes accidentally made it available for purchase on 12 May. The album was released in the United States on 8 June to general and critical acclaim. Pitchfork named it Best New Music. In an interview with Triple J talking about the album's nomination for the J Award, Parker stated that they had secretly been recording a new album. "Jay and I have been recording pretty compulsively and album number two is nearing potential completion already and I'm so excited about it that I'm having trouble keeping myself from telling you all about it". This came only months after Innerspeaker was released. 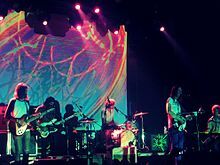 The group toured in mid-2010, commencing the Innerspeaker album tour on 13 May 2010 as the opening act for MGMT's 2010 American tour. The band returned to Australia to play at Splendour in the Grass festival, which was followed by a European Tour in July (including an appearance at the Reading Festival) and a national Australian tour in October. In November they returned to the UK and Europe for a fifteen date tour, including their largest London headline show to date which was attended by Noel Gallagher, Tom Meighan, Sergio Pizzorno, Noel Fielding, Alexa Chung and Alison Mosshart, the band then went on to the United States and Canada for twenty headline dates including sold out shows in Toronto, New York, Los Angeles, and San Francisco. They also received four 2010 ARIA Music Awards nominations which include, "Album of the Year" and "Best Rock Album" for Innerspeaker, "Best Group" and also "Breakthrough Artist". On 29 November 2010, Innerspeaker won Australian youth-oriented radio network Triple J's highest honor, winning the J Award for Album of the Year. On 7 December 2011, Parker began mixing the second Tame Impala album, Lonerism, with producer Dave Fridmann. On 2 March 2012, Tame Impala announced on Facebook that the new album was "finished, mixed, mastered, mooged, broinged, and beeped". Jay Watson expected it to be released in mid-2012, but it was released in October 2012. Parker said that Lonerism "represents a departure from his previous work by incorporating an expanded sonic palette, more emotional song writing, and a more pronounced narrative perspective". It was created in a similar set up as Innerspeaker, whereby Parker wrote and recorded the majority of the album by himself at his girlfriend, Jivani Duke's, home in Perth, Australia. Parts of the recording also occurred in Parker's home studio in France. While in France, Parker produced and played on the self-titled dream pop album by Melody's Echo Chamber, the project of French singer Melody Prochet. As a result, one of the tracks on Lonerism is titled "Endors Toi", which roughly translates from French to English as "fall asleep". The album cover is a photo taken by Parker of the Jardin du Luxembourg in Paris, France, with additional editing by Leif Podhajsky, a graphic designer who created the album art for Innerspeaker. The image ties into the themes of isolation of Lonerism, with a metal gate separating the viewer from the people in the Gardens. On 27 June 2012, the band released an album teaser on their Facebook Page. The band released the song "Apocalypse Dreams" for free download on 7 July 2012. The first single "Elephant" was released in July 2012. The album was released on 5 October in Australia, 8 October in the United Kingdom and 9 October in the United States. StillinRock described it as the best album of the year. The album features the songs "Apocalypse Dreams" and "Elephant", which are some of the first songs that Parker has co-written with Watson. "Feels Like We Only Go Backwards" was released as the second single. In November 2012, Lonerism won the 2012 J Award for Australian Album of the Year. It was the second time Tame Impala had won the award, after also winning it for their debut album Innerspeaker in 2010. They are the first band to win the J Award more than once. In January 2013, Lonerism was selected by Rolling Stone for the 2012 Album of the Year award after the band also won the award in 2011 for Innerspeaker. It was also announced as album of the year by UK magazine NME. Additionally, Lonerism was voted number one overall in Rolling Stone, Triple J, NME, Filter, Urban Outfitters, FasterLouder and Obscure Sound's 2012 Album of the Year polls. Lonerism became the first Australian album to win NME's album of the year. "Elephant" and "Feels Like We Only Go Backwards" appeared at number 7 and 9 respectively in Triple J's Hottest 100 for 2012. The band began an international tour in 2012 through 2013, supported by The Growl. During this tour, they played major festivals, such as Coachella, Sasquatch Festival, and appeared on Late Night with Jimmy Fallon. For this tour Watson switched from drums to keyboards and Parker recruited Julien Barbagallo on drums. In September 2012, Tame Impala's first U.S. feature appeared on the cover of the publication The FADER, in its 82nd issue. "Elephant" was used in advertisements for the Blackberry Z10, in the second-season finale of HBO's Girls, and in the film The Fifth Estate. On 18 May 2013, it was announced via Facebook that Allbrook would leave the band to focus on other musical endeavors, and that Cam Avery of Pond and The Growl would take his place. Allbrook played his final gig with the band on their last Australian tour date of 2013 at Perth's Belvoir Amphitheatre, the same venue that Allbrook played his first gig with the band at in 2008. As a farewell gesture, the band played a cover of Outkast's "Prototype". Lonerism received a 2014 Grammy Award nomination in December 2013 in the Best Alternative Music Album category. Reflecting on the album in a 2019 interview about the impact of Lonerism with Beats 1 host Matt Wilkinson, Parker said he would dedicate the album to his younger self, as a teenager. "I’d give him a signed copy of the album, saying ‘Don’t worry, you got out the other end,’" Parker said, adding that he feels that Lonerism was a form of "therapy" for himself as a teenager. He continued: "I didn’t have a solid base to fall back on then, so I was tackling a lot of things on my own. And I was just lost. I remember thinking, 'I’ve got no-one'. I remember once, when I was 15 or something, I was brushing my teeth, and I just broke down crying. I just felt so alone. And so, this album, it kind of validates... it makes that all [seem] like it had a purpose, like I wasn’t just completely aimless and without hope. That’s the thing about Lonerism - I listened to it this morning [before the interview], and I was like, 'It’s got this weird hopefulness to it'. Maybe that’s the charm of it. Maybe that’s why it’s done so well." Parker added to Wilkinson that his favourite song on the album is Music To Walk Home By, and that his favourite lyric is from Elephant: "He pulled the mirrors off his Cadillac / ‘Cause he doesn’t like it looking like he looks back". Right now, doing another album doesn’t excite me. There’s something narrow-minded about thinking an album is the only way you can put out music, especially in the world we’re in at the moment. Anything is possible. There’s so many people doing interesting things with the internet and technology, there could be so many ways of making music and listening to it. It’s 2013 and you can make music anywhere ... There are so many possibilities, my brain is overloading on them all. I just need to wait, think about things a bit more. Then I’ll know what to do next. In May 2014, Parker spoke of his growing inclination toward the recording of another album in a triple J radio interview, explaining that: "I'm getting more and more sucked into the world of making an album. It's weird how it happens naturally, it's almost feels like a seasonal thing. I've started to think about tracklistings and all the things that come with an album." Describing the sound of the new album, Parker said "I'm gonna try to make it a bit more minimal this time; only use what's needed ... instead of a supreme pizza, where you just throw everything on". Watson added: "[It’s] probably gonna be less rock again and more electronic again, even more than the last one". Parker later stated that the inspiration behind the new polished sound of Tame Impala's third album came from listening to a Fleetwood Mac song. He said that the pureness and cleanness of Fleetwood Mac's song prompted him to attempt to create a more streamlined musical style within Currents. On 6 January 2015, Spinning Top Music announced that a new Tame Impala album will be released in 2015. During the same month, it was announced that the band would perform at the Boston Calling Music Festival in May 2015. On 11 March 2015, a new song entitled "Let It Happen" was released as a free download. On 5 April 2015, Tame Impala announced and released the album cover for Currents in a Facebook post. A few hours later the band released the first official single from the upcoming album on Facebook called "'Cause I'm a Man". Later that month, on 22 April 2015, Tame Impala officially released "Let it Happen" as the second single from the album. One week later, on 29 April 2015, Kevin Parker held an AMA on reddit, where he provoked fans to ask him to release a new song, then responding with "Disciples", which became the third single for the upcoming album Currents. On 7 May 2015, the band announced that the album would be released in 17 July 2015 and released the fourth single, "Eventually". During the same 30 April 2015 reddit AMA, Parker said, "Up until recently, from all of Tame Impala's record sales outside of Australia I had received.... zero dollars. Someone high up spent the money before it got to me. I may never get that money." In April 2016, Parker stated that he was writing new music but was unsure if it would be for Tame Impala or "for someone else". In October 2017, a Collector's Edition of Currents was announced. Released on 17 November, it included three B-sides and two remixes. By the end of 2017, Tame Impala announced that they agreed to play the 2018 Mad Cool musical concert in Spain, which would be the first live music show the band agreed to play in 2018. Tame Impala also played a headline set at London's Citadel Festival in July 2018. In July 2018, during an interview with Beats 1 anchor host Matt Wilkinson, Parker confirmed for the first time that he had begun working on a new Tame Impala album, adding that he was “ready to play some other songs live” and expressing an interest to headline a stage at Glastonbury Festival in 2019. He also stated that he would be “very disappointed” if the new record by Tame Impala wasn’t released by summer 2019. On 1 July 2018, Tame Impala teamed up with artist ZHU to create the single "My Life". In October 2018, Parker played bass for rapper Travis Scott for a performance of "Skeletons/Astrothunder" on Saturday Night Live, with singer-songwriter John Mayer also part of the backing band. On 10 October, the band was scheduled to headline the first night of the annual Desert Daze festival in its new location in Moreno Beach, but had to cut their set short after 3 songs due to inclement weather. On 14 October, female R&B singer SZA released the single "Together" on YouTube, which is billed as "SZA featuring Tame Impala." Later that month, on 31 October, rapper Theophilus London released a new single in collaboration with Tame Impala under the moniker of Theo Impala. On 2 January 2019, Tame Impala was announced as a headliner for the 2019 Coachella Valley Music and Arts Festival. They will also headline the 2019 Primavera Sound festival, making them only the second Australian act to do so. Parker had recently announced a forthcoming new album that he expects will be released during the summer. On 21 March 2019, Tame Impala released the single "Patience", and has teased new music on Instagram for the forthcoming album. They were the musical guest for Saturday Night Live on 30 March, with host Sandra Oh. On the show, the band performed "Patience" and a new song, "Borderline", which was released 12 April. Tame Impala's music and live visuals are heavily influenced by psychedelic music. Experimentation with different effects pedals such as Roland RE-20 Space Echo, has led to Parker creating new and unique sounds. "If you make an effort to not put the pedals in the order you're meant to, then you'll end up with something new sounding. We don't have any things that we got from another planet or anything, it's the same things everyone else has used." "People have a distortion pedal and then a reverb pedal. A reverb is meant to make it sound like it's in a cathedral or something. If you put it the other way around, it won't sound like a guitar being played in a church, it'll sound like a church being stuffed inside a shoebox and then exploded. You can do different things just by treating things differently." Parker also has a strong sense of melody in his music, having composed "excessively melodic music from about the age of 12 to 15". As a result of Parker's love of melody, he also has revealed that he has a "fetish for extremely sugary pop music" from artists like Britney Spears and Kylie Minogue. In addition to a love of melody, Parker also loves "fucked-up explosive cosmic music" in the vein of The Flaming Lips, with whom Parker collaborated on the track "Children of the Moon" in 2012, for the release The Flaming Lips and Heady Fwends. Combining these two things, My Bloody Valentine have influenced Parker's music with their contrasting combination of loud guitars and ethereal melodies. Parker has "always been in love with the wall of sound as employed by My Bloody Valentine" and he tries to capture that "melancholy dreamy feel". Parker tries to incorporate this balance into his own music. "If I was singing, I wouldn't be able to match the tone of the instruments, which is really crunchy. The instruments are quite sonically brutal, but the voice is really soft, and I think that kind of resonates with people. It's kind of like My Bloody Valentine, where it's really brutal sounding, but kind of beautiful at the same time". Tame Impala live drummer Jay Watson has described Parker's music as containing "shoegazey guitar sound, but not played in a shoegazey manner". Electronic music is another influence. Parker has used rock instrumentation in an electronic manner, saying "The way we do music, it's organic, but it's meant to be quite repetitive and hypnotic, almost in a kind of electronic nature. Using our playing as though it was a living sample". A heavy feature on Innerspeaker is a pitch-shifted guitar tone that many mistook for a synth. Parker mentioned this by saying "I had a few obsessions when recording Innerspeaker. One was to make the guitars sound like synths and drums sound like drum samples and pretty much anything except guitars and drums. I'm obsessed with confusing people as to the origin of a sound." Parker was inspired to take up various creative endeavors at a young age, "I used to draw a lot when I was very young, and I used to get the most immense feeling of satisfaction from finishing a picture and looking back at it, even though I wasn’t actually that good. When I started playing music I got the same feeling from making a song, even if it was just a few noises or drum patterns put together. It was all about the buzz from making something from nothing. Music always affected me greatly as a listener anyway, usually from listening to music in my dad’s car or listening to him play guitar." Parker's process for making music is "I’ll have a sudden, spontaneous vision of a song, have all the parts mapped out in mind, and do my best to record it as quick as I can. I’ll find my eight-track and do a quick demo of just the riff, or a verse or a chorus. The song will go for like 30 seconds. I’ll have a whole bunch of them [demos] and then I’ll just choose which ones to make into full songs". For Parker, the music comes before the lyrics, "I usually write the lyrics after the melody and its timing have been decided. But the words have to be meaningful. I try to synchronise certain words with the best parts of the melody, but it can be really difficult and does my head in. I like to keep the meaning pretty open and ambiguous so that it’s not just me that gets something out of the lyrics. I usually write lyrics from a persona rather than tell a specific story." Parker also said "Usually I am sufficiently motivated to think of new songs everyday, but I usually forget them. I seem to get an emotional kick out of sensing feelings of general desperation or hopelessness, whether it’s me or someone near me or someone in a movie or anything. It’s really difficult to sit down and force yourself to write a song, and that forced nature usually comes out in the song so I just have to wait until they come to me." Lo-fi music is also a favourite of Parker's, and he incorporated it heavily in the early days of Tame Impala, heard prominently on the Tame Impala EP. With the release of Innerspeaker, Parker went for a different approach to a lo-fi sound, aiming more for a more cosmic and sonic wall of sound, helped by mixer Dave Fridmann. Parker explained "It sounds more cohesive, like an organism. It has a different emotion to it, it brings out a different feeling when it’s absolutely blaring at you. I love that sound." Parker has also stated that Supertramp, one of his favourite bands, are a major influence on the musical style of Tame Impala. Despite their difference in sound, he feels he is always somewhat "channeling Supertramp". He has said that listening to the Bee Gees on mushrooms and cocaine inspired him to change the sound of the music he was making on Currents. Responding to an interviewer's question regarding the subject in 2018, Jay Watson stated that while he does not do drugs any more, "I thought everything had asbestos in it for some reason, for a few years there." ^ "Tame Impala | Music". The Guardian. Archived from the original on 14 July 2014. Retrieved 3 July 2014. ^ Gregory Heaney (8 October 2012). "Lonerism - Tame Impala | Songs, Reviews, Credits, Awards". AllMusic. Archived from the original on 23 June 2014. Retrieved 3 July 2014. ^ Gourlay, Dom (23 October 2012). "Album Review: Tame Impala - Lonerism / Releases / Releases // Drowned In Sound". Drownedinsound.com. Archived from the original on 22 February 2014. Retrieved 3 July 2014. ^ "taym im-PAH-la" – Pitchfork Weekly. "Tame Impala Session Teaser / Interview (0 mins 25 sec)". Pitchfork Weekly. Archived from the original on 17 October 2013. Retrieved 16 June 2013. ^ "Tame Impala | Biography, Albums, & Streaming Radio | AllMusic". AllMusic. Archived from the original on 9 July 2016. Retrieved 21 July 2016. ^ "Tame Impala Discuss New Album 'Currents', Release Album Artwork and New Track 'Cause I'm A Man' [LISTEN] : Genres". Music Times. Archived from the original on 20 July 2015. Retrieved 17 July 2015. ^ a b "Tame Impala-"Eventually"". DeVille, Chris. 7 May 2015. Archived from the original on 8 May 2015. ^ Brandle, Lars (6 April 2016). "Courtney Barnett, Tame Impala's Kevin Parker Win Big at APRA Awards". Billboard. Archived from the original on 22 December 2016. Retrieved 6 December 2016. ^ Cashmere, Paul (7 July 2008). "Tame Impala Sign With Modular". Undercover.com.au. Archived from the original on 21 July 2008. Retrieved 19 February 2009. ^ "Tame Impala - Lonerism". The Line Of Best Fit. 3 October 2012. Archived from the original on 20 February 2015. Retrieved 17 July 2015. ^ "Tame Impala Tickets, Tour Dates 2015 & Concerts – Songkick". Songkick.com. Archived from the original on 6 October 2014. Retrieved 17 July 2015. ^ "Aria Charts new releases September 2008". Aria.com.au. Archived from the original on 11 March 2015. Retrieved 17 July 2015. ^ "Tame Impala: ANTARES MIRA SUN". Merge Magazine. Archived from the original on 25 December 2008. ^ Carr, Matthew (17 November 2008). "Tame Impala - Antares, Mira, Sun". FasterLouder.com. Archived from the original on 24 May 2011. ^ "MTV Exclusive Interview with Tame Impala". MTV Australia. 11 February 2009. Archived from the original on 15 February 2009. Retrieved 19 February 2009. ^ "Top 50 Physical Singles Chart". ARIA. Archived from the original on 29 October 2006. Retrieved 11 December 2008. ^ "The hit list | triple j". Abc.net.au. Archived from the original on 1 November 2008. Retrieved 17 July 2015. ^ "Tame Impala @JPLay". JPlay. Archived from the original on 18 March 2012. Retrieved 19 February 2009. ^ Mengel, Noel (26 January 2009). "Kings of Leon top Triple J's Hottest 100". Courier Mail. Archived from the original on 31 January 2009. Retrieved 19 February 2009. ^ "Triple JHottest 100 - 2008". Triple J. Archived from the original on 30 January 2009. Retrieved 19 February 2009. ^ "Tame Impala tour". WA Today. 21 July 2009. Archived from the original on 23 July 2009. Retrieved 21 July 2009. ^ "Mod Blog". Modular Recordings. Archived from the original on 4 August 2008. Retrieved 23 July 2009. ^ "Mod Blog". Modular Recordings. Archived from the original on 27 July 2009. Retrieved 23 July 2009. ^ "Hottest 100 2009". triple j. ABC. 2009. Archived from the original on 11 February 2013. Retrieved 19 December 2013. ^ "The Kids Are All Right (Original Motion Picture Soundtrack)". iTunes Preview. Apple Inc. 6 July 2010. Archived from the original on 15 April 2014. Retrieved 19 December 2013. ^ "Tame Impala". rage. ABC. 6 October 2012. Archived from the original on 20 December 2013. Retrieved 19 December 2013. ^ Marcus (29 September 2009). "Big Day Out 2010 lineup announced". The Vine. Digital Media. Archived from the original on 23 October 2013. Retrieved 19 December 2013. ^ "Tame Impala: Innerspeaker | Album Reviews". Pitchfork. 28 May 2010. Archived from the original on 16 July 2015. Retrieved 17 July 2015. ^ "NME News Kasabian's Tom Meighan offloads stagewear to Oxfam - Daily Gossip". Nme.Com. 29 October 2010. Archived from the original on 20 July 2015. Retrieved 17 July 2015. ^ "J Awards 2010". Triple J. 29 November 2010. Archived from the original on 21 December 2010. ^ "Dave Fridmann". Dave Fridmann. 7 December 2011. Archived from the original on 16 November 2016. ^ "New Tame Impala Album Due Mid 2012". musicfeeds.com.au. Archived from the original on 22 February 2012. Retrieved 20 February 2012. ^ "Lonerism Album Cover". Leif Podhajksy. Archived from the original on 19 July 2012. Retrieved 13 July 2012. ^ "Tame Impala Announce New Album, Share Track | News". Pitchfork. 8 July 2012. Archived from the original on 11 October 2012. Retrieved 8 October 2012. ^ "Actualité musicale : Rock, Pop, indie. : Album Review : Tame Impala - Lonerism (Rock Psyche)". Still in Rock. 26 February 2004. Archived from the original on 26 July 2013. Retrieved 8 October 2012. ^ "The Taming Of The New ♫ Interviews at". Themusic.com.au. Archived from the original on 14 December 2012. Retrieved 8 October 2012. ^ "Hottest 100 Countdown". triple j. ABC. 2012. Archived from the original on 16 December 2013. Retrieved 17 December 2013. ^ Kyle McGovern (19 February 2013). "Watch Tame Impala Return to 'Fallon' With 'Elephant'". Spin. Spin Media. Archived from the original on 6 October 2014. Retrieved 17 December 2013. ^ Gabay, Yves (11 July 2013). "Tame Impala : un Toulousain dans la pop australienne, ce soir au Bikini". lapeche.fr (in French). la Dépêche du Midi. Archived from the original on 20 November 2015. Retrieved 7 September 2015. ^ FADER, The (25 September 2012). "World Premiere! The FADER Issue #82: Featuring French Montana and Tame Impala". The FADER. Archived from the original on 13 May 2013. Retrieved 18 November 2013. ^ PhoneAds (4 February 2013). "BlackBerry Z10 Commercial Ad" (Video upload). YouTube. Google Inc. Archived from the original on 13 January 2014. Retrieved 17 December 2013. ^ "Girls Season 2 Soundtrack List (2013)". SongOnLyrics. SongOnLyrics.com/Soundtracks. 2013. Archived from the original on 26 December 2013. Retrieved 17 December 2013. ^ "The Fifth Estate Soundtrack List". Soundtrackmania. Retrieved 29 September 2013. ^ "Nick Allbrook leaves Tame Impala". Music Blogged. 18 May 2013. Archived from the original on 3 December 2013. Retrieved 19 May 2013. ^ Peter Vincent (7 December 2013). "Lorde now Australian say Grammys; Tame Impala and Keith Urban nominated". Sydney Morning Herald. Archived from the original on 10 December 2013. Retrieved 17 December 2013. ^ "Sleeve Notes: Tame Impala, Lonerism". Apple Music. 28 January 2019. Retrieved 28 January 2019. ^ "Instagram". Instagram. 17 February 2014. Archived from the original on 21 August 2015. Retrieved 17 July 2015. ^ "Tame Impala's Kevin Parker talks Flaming Lips influences, his disco-funk band". Heyreverb.com. 24 October 2013. Archived from the original on 20 July 2015. Retrieved 17 July 2015. ^ "NME News Tame Impala's Kevin Parker: 'Doing another album doesn't excite me'". Nme.Com. 23 May 2013. Archived from the original on 21 July 2015. Retrieved 17 July 2015. ^ "Kevin Parker talks Mink Mussel Creek, new Tame Impala | music news | triple j". Abc.net.au. 20 May 2014. Archived from the original on 21 January 2015. Retrieved 17 July 2015. ^ "Kevin Parker talks new Tame Impala: "instead of a supreme pizza, it's gonna be a margherita" | music news | triple j". Abc.net.au. Archived from the original on 21 January 2015. Retrieved 17 July 2015. ^ "Tame Impala will be "less rock and more electronic" on next album". Fasterlouder.com.au. 20 November 2014. Archived from the original on 22 July 2015. Retrieved 17 July 2015. ^ Greenhaus, Mike (17 June 2015). "Tame Impala's Eclectic 'Currents'". Relix. Archived from the original on 27 September 2016. Retrieved 25 September 2016. ^ "NME News Tame Impala to release new album later this year". Nme.Com. 5 January 2015. Archived from the original on 21 July 2015. Retrieved 17 July 2015. ^ Ollman, Jonah. "Boston Calling Announces May 2015 Lineup". Sound of Boston. Archived from the original on 6 February 2015. Retrieved 15 January 2015. ^ "Listen to the Epic New Tame Impala Track". Rolling Stone Australia. Rolling Stone Australia. Archived from the original on 13 March 2015. Retrieved 11 March 2015. ^ TAME IMPALA - 'Cause I'm A Man. YouTube. 5 April 2015. Archived from the original on 5 April 2015. ^ "tameimpalamusic comments on I am Kevin Parker from Tame Impala. Ask me Anything!". Reddit.com. 29 April 2015. Archived from the original on 13 November 2015. Retrieved 17 July 2015. ^ Havens, Lyndsey (6 April 2016). "Tame Impala frontman Kevin Parker is working on new music". Consequence of Sound. Archived from the original on 9 December 2016. Retrieved 1 December 2016. ^ Monroe, Jazz (23 July 2018). "Kevin Parker Talks New Tame Impala Album, SZA Collab, More". Pitchfork. Retrieved 23 July 2018. ^ "Travis Scott Performs 'Skeletons/Astrothunder' on 'SNL' With John Mayer and Kevin Parker: Watch". ^ "Desert Daze Lineup 2018". ^ "Together by SZA featuring Tame Impala". ^ Blais-Billie, Braudie. "Watch Tame Impala Debut New Song 'Borderline' on "SNL"". Pitchfork. Retrieved 31 March 2019. ^ K. Ross Hoffman. "Innerspeaker - Tame Impala | Songs, Reviews, Credits, Awards". AllMusic. Archived from the original on 21 June 2014. Retrieved 3 July 2014. ^ "Nylon TV Interview". Nylon TV. Archived from the original on 26 June 2014. Retrieved 14 July 2012. ^ a b c "Tame Impala - Inner Visions". Mess and Noise. Archived from the original on 30 June 2012. Retrieved 14 July 2012. ^ "Undercover TV interview". Undercover TV. Archived from the original on 31 December 2012. Retrieved 14 July 2012. ^ "LA Times interview". LA Times. Archived from the original on 21 December 2011. Retrieved 13 July 2012. ^ a b c d e "Tame Impala WOW Magazine Interview". WOW Magazine. Archived from the original on 6 August 2013. Retrieved 14 July 2012. ^ "In the Studio feature". tameimpala.com. Archived from the original on 31 March 2012. Retrieved 13 July 2012. ^ "The Flaming Lips Official Store - Music, CDs, T-Shirts, Merchandise". Flaminglips.com. Archived from the original on 23 April 2012. Retrieved 17 July 2015. ^ "Tame Impala's Kevin Parker Discusses His Band's Success, Origins and Impressions of California". LA Times. Archived from the original on 21 December 2011. Retrieved 14 July 2012. ^ "Tame Impala en entrevista para Sopitas.com". YouTube. Archived from the original on 17 October 2013. Retrieved 14 July 2012. ^ "Tame Impala Hartzine interview". Vimeo. Archived from the original on 28 September 2013. Retrieved 14 July 2012. ^ "Tame Impala KCRW interview". KCRW. Archived from the original on 21 July 2012. Retrieved 14 July 2012. ^ Doug Wallen (16 January 2014). "Tame Impala: "I have no idea how successful [we] are"". TheVine. Archived from the original on 1 February 2014. Retrieved 20 January 2014. ^ "Tame Impala's Kevin Parker reveals listening to the Bee Gees while on drugs inspired his new album". NME.COM. Archived from the original on 14 December 2015. Retrieved 17 November 2015. ^ Dan Webb (18 April 2018). "Tame Impala's Jay Watson talks fame, drugs and tennis". Sungenre. Retrieved 22 May 2018.